The beginnings of the project install before the photo frames were added. Designs from left to right are Bees in the Bottle-brush, Butterfly Gem, Birds in the Flowers, Hibiscus Swirl & Leadbeater Forrest. 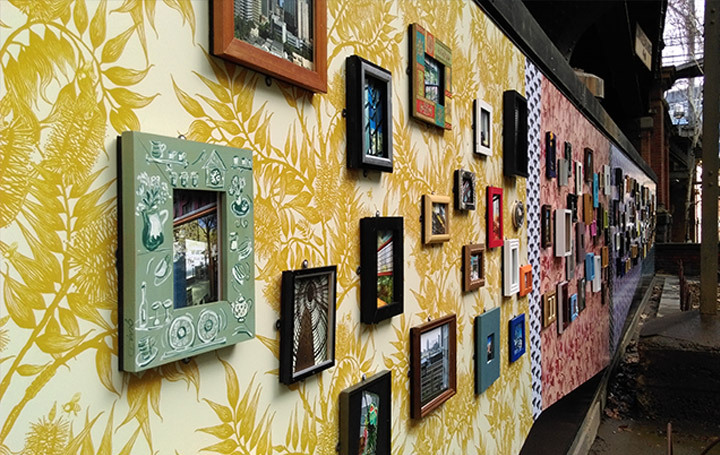 Close up of the finished project with the photo frames. Elevation view showing the scale of the project. Another close up from the right side of the project. Wallpaper design Leadbeater Forest. The left side of the project showing our Bees in the Bottlebrush design. 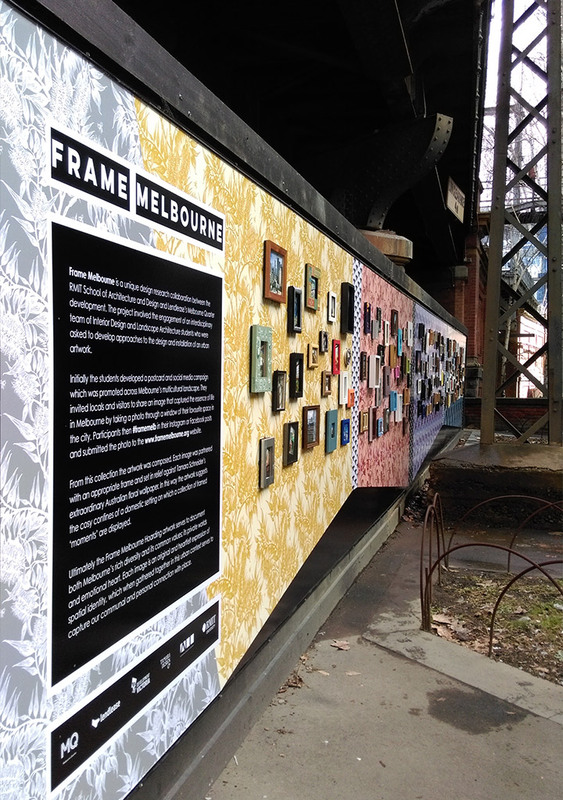 Frame Melbourne is a project run by landscape Architecture students from RMIT’s School of Architecture and Design and Lendlease’s Melbourne Quarter development. 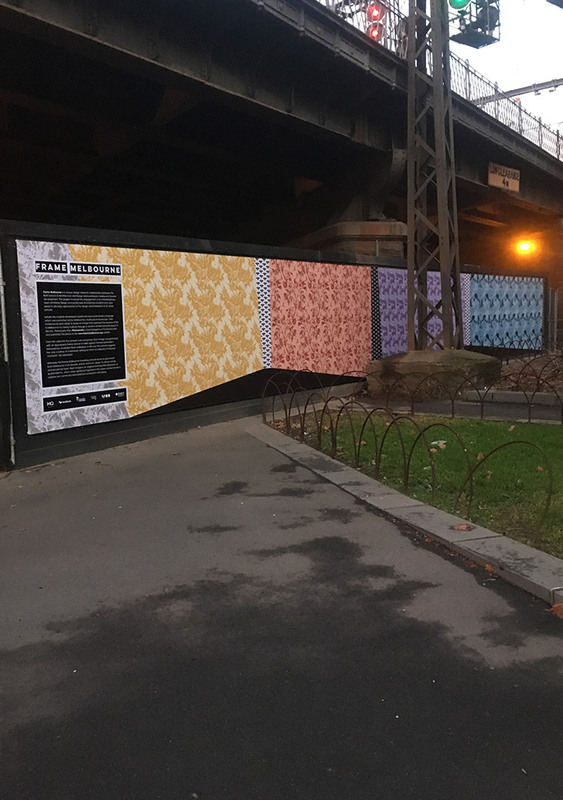 The students designed an interactive artwork gallery on a 17 metre long hoarding as part of Melbourne Quarter’s site on the corner of Spencer and Flinders Streets. 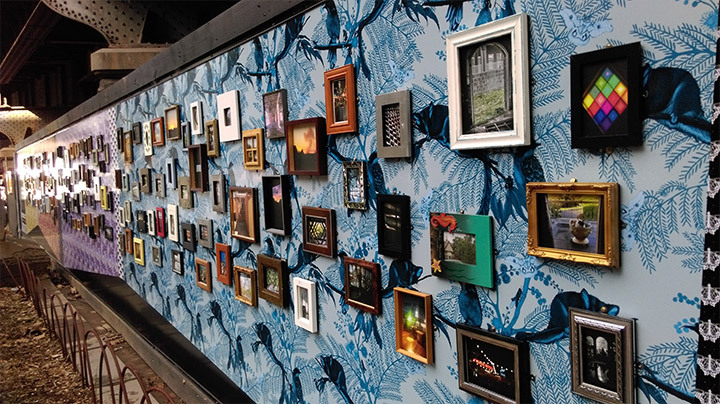 The project captures the essence of life in Melbourne through photographs taken by the public looking through a window of a favourite space in the city.​ The images needed to include include the window frame and part of the room interior but no people. All the images needed to be hashtagged # FRAMEMELB then shared on Instagram and Facebook before being uploaded to the main website. A selection of these photographs were then printed and framed to form part of the exhibit. 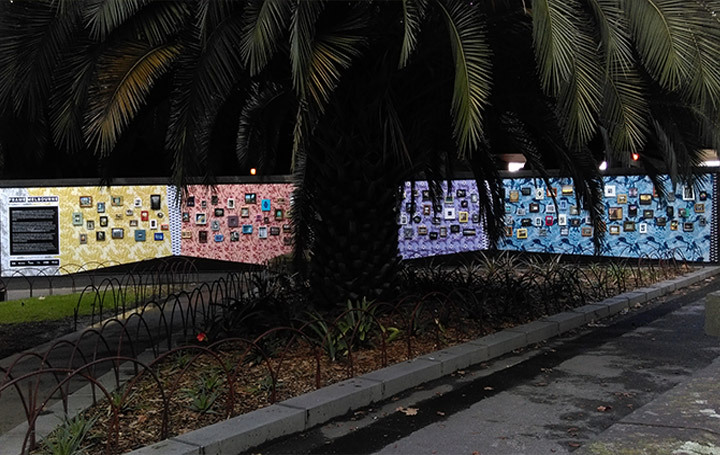 Tamara design Co was asked to supply a number of wallpaper designs to be used as the backdrop for the photographs the students re-coloured the designs to suit their creative vision. 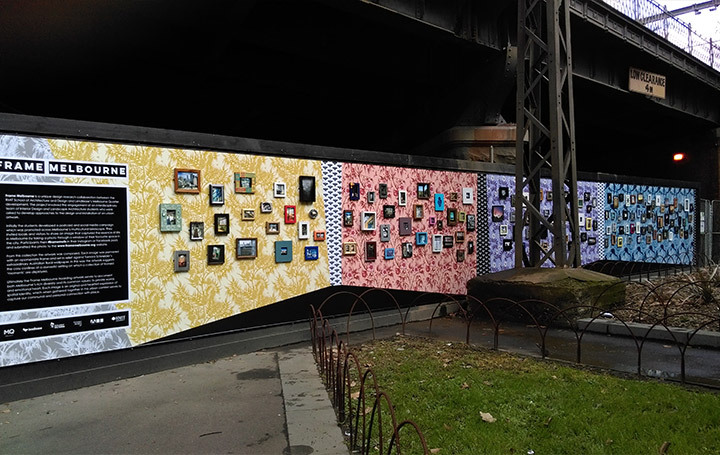 You are invited to check out the Frame Melbourne exhibition which will run thoughout 2017 at the temporary Melbourne Quarter Hoarding Gallery on the corner of Spencer and Flinders streets in Melbourne. Head on over to their website for more information. 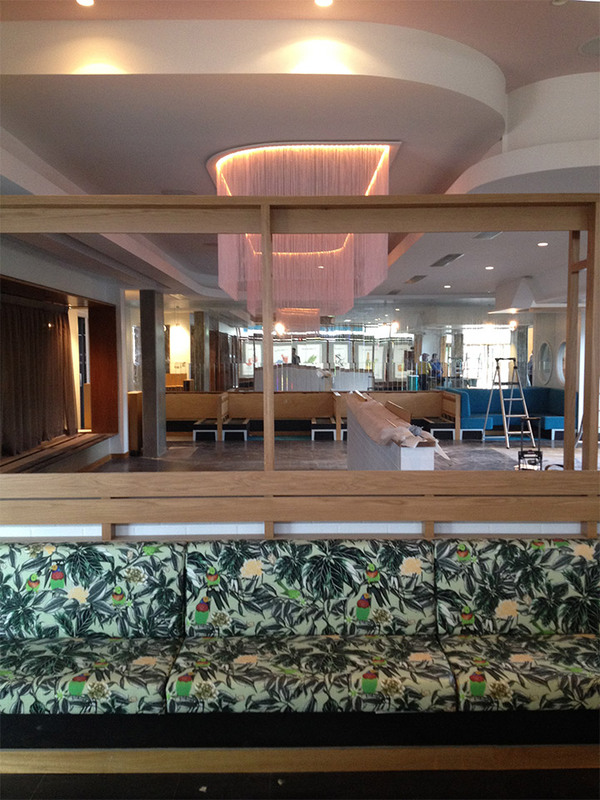 Jungle birds fabric in green on a banquette seat and wallpanel at the Darling & Co Brisbane, Interior fit-out by Brisbane architectural firm Marc & Co – photo courtesy of Must do Brisbane. 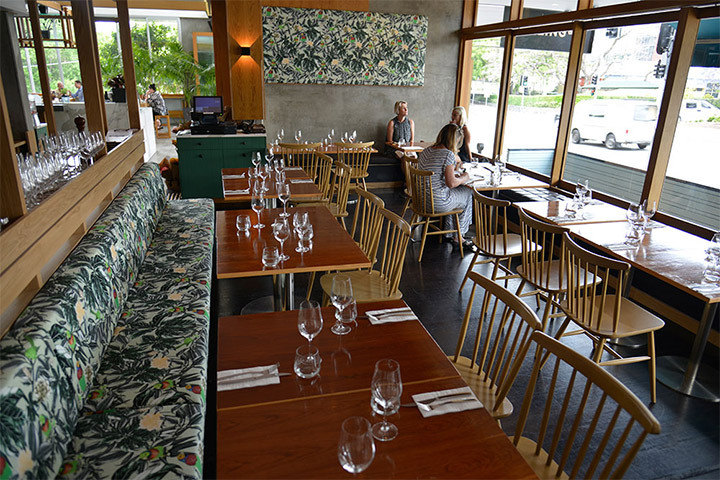 Show casing Jungle birds fabric in green on the banquette seat at the Darling & Co Brisbane, Interior fit-out by Brisbane architectural firm Marc & Co – photo courtesy of Marc & Co. 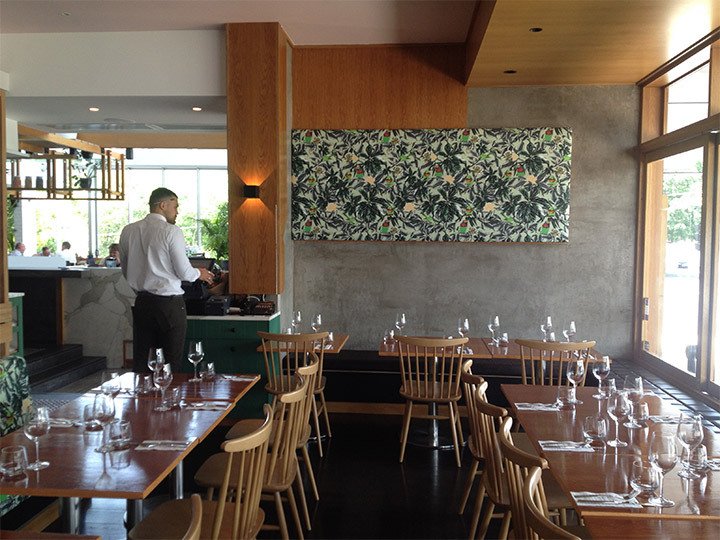 Jungle birds fabric in green on a banquette seat and wall-panel at the Darling & Co Brisbane, Interior fit-out by Brisbane architectural firm Marc & Co – photo courtesy of Marc & Co.
Our Jungle Birds fabric was chosen by Marc & Co Architecture firm for a banquette seat feature and wall-panel in the new restaurant Darling & Co in the Brisbane precinct of Paddington. The design has lush green foilage and features the endangered Gouldian finch nestled in between the leaves, it perfectly compliments the light and airy modern interior of the new venue. 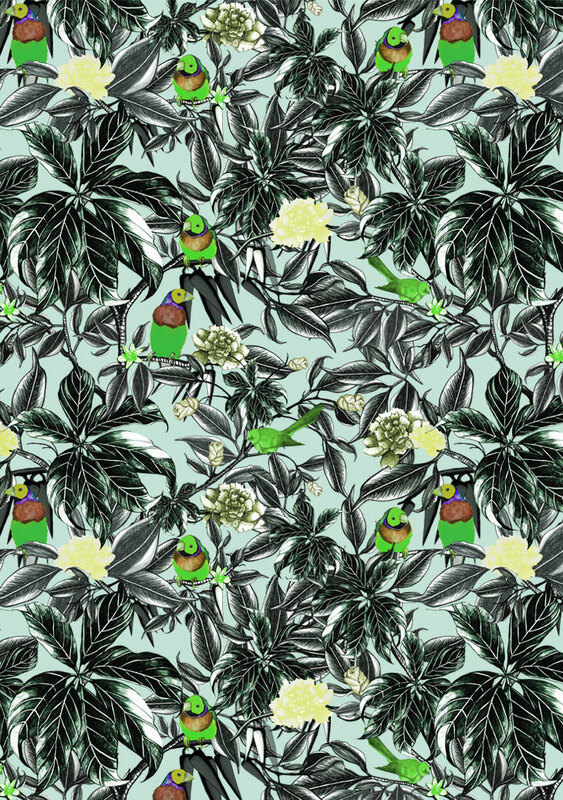 We have a number of fabrics that can be printed with the Jungle Birds design that are suitable for both commercial and residential interiors. The design is available as a wallpaper too. If you would like to incorporate Jungle Birds into your interior or order a sample of this fabric please contact us here.